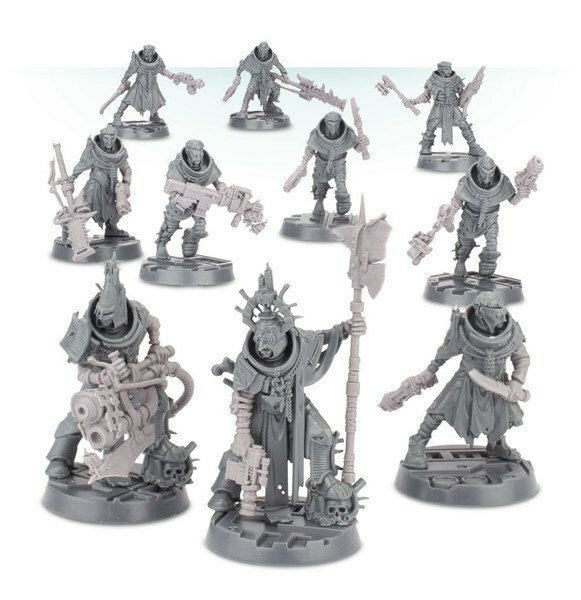 A shotgun of new pre-orders this week from Forge World. There's new Orcs for your Blood Bowl teams. There's new new House Cawdor weapon packs for Necromunda. And there's Denethor and Irolas for the Lord of the Rings. So, Fantasy Sports, Sci-fi skirmish, and fantasy army game. It's a little for everyone. Orcs have been playing Blood Bowl since the game was discovered – indeed it was an Orc who discovered the shrine where the sacred book of Nuffle was hidden. 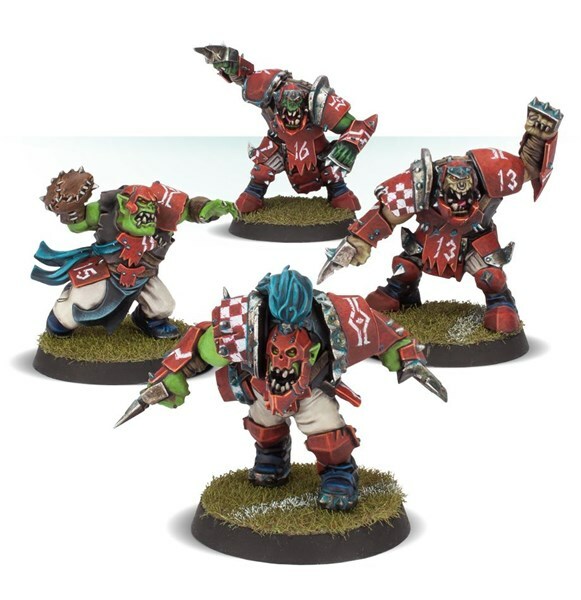 Orc teams are very hard-hitting, concentrating on pounding an opponent into the turf to create gaps through which the excellent Orc Blitzers can run. Indeed, if any fault can be found with Orc teams in general, it is that they sometimes spend a little bit too much time pounding the opposition, and not enough time running the ball to score! Expand your roster and add variation to your line-up with this booster pack! It contains 4 resin miniatures – 1 Blitzer, 1 Thrower and 2 hulking Black Orcs, each covered in detail and posed dynamically, as well as differently to the plastic models from the Blood Bowl boxed game. They're the perfect way to add variety to your Orc Blood Bowl team. These 4 resin miniatures are supplied with 4 32mm Blood Bowl bases. Up-to-date Orc team rules can be found in the Blood Bowl Almanac 2018. Given the poverty that grips House Cawdor, most of the House’s allied gangs favour simple and effective weaponry – the battered autogun, the trusty stub gun and the rusty knife are all good enough for a Cawdor ganger. In fact, Cawdor gangs have a special talent for restoring discarded guns and blades, scraping together a working weapon from the parts of several others or making a new weapon onto which they can painstakingly carve the scriptures of their faith. Fire is a favoured tool of the gangs, for it is simple to use and, like the doom that devours the galaxy, consumes all in its path. Creating incendiary grenades, flamers and other fire-based weapons is a simple task within a hive, for the flammable fuel and waste lines that run through the great city’s walls are easily syphoned off. In combat, killing a foe in the white-hot furnace of a well-placed flamer burst, or in the blinding halo of a fire bomb, is an almost holy act for a Cawdor ganger, the piteous screams of the heretic as they burn a benediction to the Emperor, proclaiming for all to hear the true majesty of the Redemption. Although he was once a great man and has ruled Gondor for many years, Denethor’s mind has been shattered by the loss of his beloved son Boromir. In the face of endless war, and with Sauron’s dread legions upon his own doorstep, Denethor abandons all reason and opts to join the heathen kings of old, attempting to burn himself and Faramir atop a pyre. Irolas is a Captain of the Citadel Guard who defended the uppermost level of the White City and guarded the Warden himself. When Faramir was returned wounded to the city, Irolas was among those who watched over the Warden's son. 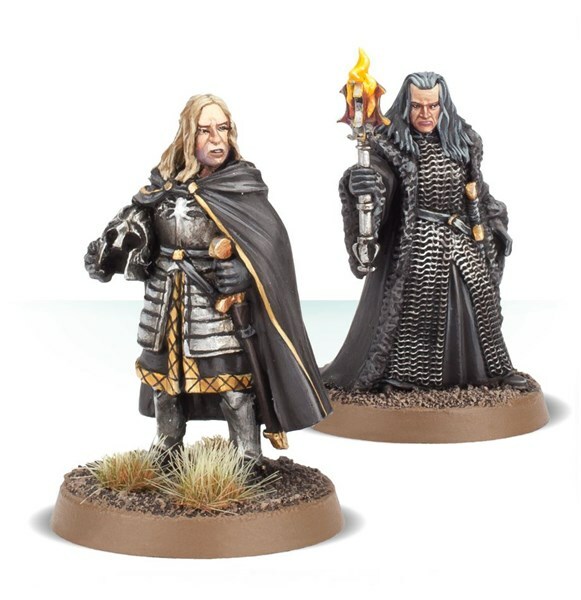 This set contains two resin miniatures in three parts representing Denethor and Irolas. Denethor is draped in heavy, ornate robes and carries a flaming torch as he hurries to set his son's pyre ablaze. Irolas is armoured as a Citadel Guard, with heavy plate and a long cloak. He is holding his helmet in one hand and the other grips the hilt of his sword. The rules for Denethor can be found in The Armies of The Lord of the Rings™, and Irolas' rules can be downloaded as a PDF below.